One of the biggest landscape contracting companies in the USA once described this attachment as “The most useful tool in his fleet”. The K9 machines, and their predecessor - the 950, all handle rotary hoes with ease. The Dingo Rotary Hoe has a full one metre cut and digs to approximately 150mm in virgin soil. Hoeing is done with the machine in reverse, so you can clearly see where you are going and you aren’t running over freshly tilled soil. Hydraulics also mean that the relief valve is the safety valve - there are no shear pins or other damaging devices. Ideally, the Dingo Rotary Hoe is suited to tight area’s - gardens, nurseries, new estates etc. The Dingo Rotary Hoe is more than simply a soil tiller like most other small hoes on the market. It hoes as well as a larger tractor mounted unit. Tines: Hardened, double edge, replaceable. 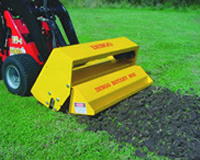 Used For: Digging garden beds, loosening topsoil for removal. Used By: Landscapers, Dingo Con-tractors, Hire Companies.